Sign ups are open for concession stand duty. This is first come, first serve on dates and times available. If you DO NOT buy out as stated above and DO NOT sign up for a concession stand date as stated below then a time will be assigned to you and you will be notified of this time. You can allow a child to work in your place for your concession stand time. HOWEVER, they must be 14+ and willing to actually work! (They are only allowed to work up front at the window). They need to know how to work with money and be comfortable making change and adding up orders. You will now be signed up. You should receive a reminder email of your work time 3 days in advance. Questions regarding the concession stand or signing up for work shifts can be directed to Amy Reed (765-438-0800) or Candice Coston (765-602-0191). Parade Theme is “Play like a Dream in 2019”. You can decorate according to theme or you can just choose to decorate with your team colors. Keep it simple and have fun! This doesn’t have to be elaborate. You will need a truck or truck pulling a trailer your team can use as a float. All players and a few coaches will need to fit on it safely in a seated position. Candy can also be purchased by players to throw at the parade (please stay away from candy with a stick or candy that breaks easily when it hits the ground). Additional information about parade staging location and times will be given at a later date. Purpose of the Fall League: Spend time developing fundamental skills of baseball through skills clinics followed by implementing the fundamentals learned in weekly developmental games. The first two Sundays, August 19 and August 26, there will be a two hour skills clinic with stations for fundamentals instruction and drills. Following Labor Day, there will be games for 5 consecutive Sundays, September 9 – October 7 with a 2 hour time limit. Proper techniques for hitting, throwing, catching, pitching, baserunning, fielding grounders, fielding fly balls, and game situations will be taught. Who can register: Open to all area kids, not confined to RYBL boundaries. No teams will be allowed to register. Fall ball shirts will be provided. The registration cost was set to cover the cost of shirts, field maintenance and materials, and baseballs. Welcome to the Russiaville Youth Baseball League(RYBL) – great park, great fans, great kids! The Russiaville Youth Baseball League played its first season on the current site (Lions Club Grounds) in 1966. Games are played at one of the best facilities in and around Howard County in Russiaville Indiana. RYBLs Cal Ripken League is a main highlight of the community with its pre-season trademark being an incredible Opening Day parade that takes over (Indiana) 26 with floats, sponsors, Western’s band and 400-plus, small-fry base thieves. Toss in a few roses, and you’d have Pasadena in April. All those associated with RYBL – players, coaches, parents, umpires, sponsors and volunteers – play important roles in making this Cal Ripken league one of the premier leagues in central Indiana. T-Ball 9 Teams with over 100 participants - The future looks bright! Spring volunteer field dates are Saturday, April 6 and Saturday, April 13 from 9 am to 4 pm. ALL help is welcome, even if you can only assist for a couple of hours. We are looking for volunteers to assist the buildings and grounds director on a regular basis for the 2019 season. Contact Tom Mashino at president@rybl.org to express your willingness to help the league in this way. RYBL baseball should be a fun and rewarding time for the players, parents, coaches, umpires, and fans. 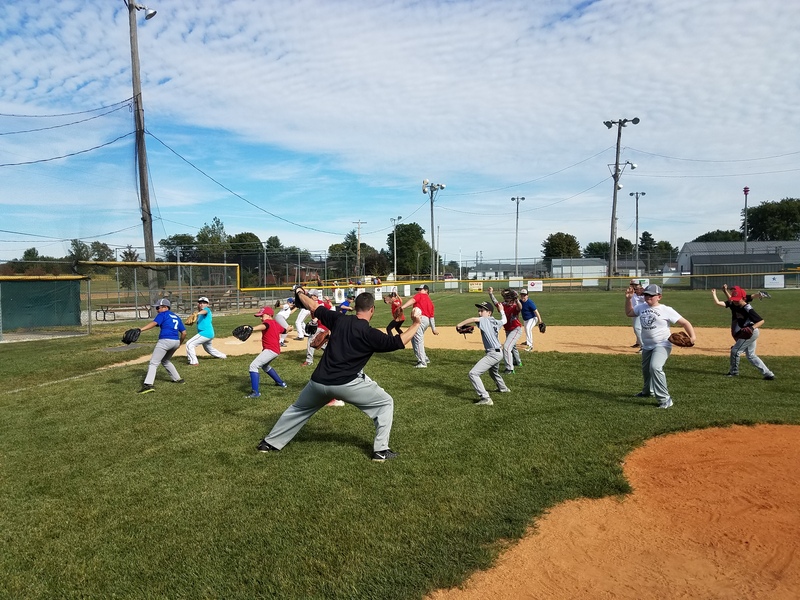 Through baseball, the Russiaville Youth Baseball League seeks to enhance the physical, mental, and emotional well-being of every child that takes part. It is the League’s express goal that every player will be a better citizen, and have a greater chance for success in future endeavors, as a result of their experiences. As such, the Russiaville Youth Baseball League expects the highest degree of sportsmanship from its members. In keeping with this philosophy, the following Code of Conduct has been adopted to better promote fairness, teamwork, trust, good citizenship, sportsmanship, responsibility, and respect among the members of the Russiaville Youth Baseball League. RYBL is a non-profit 501c3 organization and we depend on business leaders and community partners for supplemental financial support in order to offer the children of RYBL the finest youth sports experience in central Indiana. If you have an interest in helping our league, we want to partner with you. If your business is ready to join our team, then let us tell you how to make that happen. Contact our sponsorship coordinator today at president@rybl.org. Registration is now OPEN. Click the Registration Ribbon on the rybl.org home page and select "Babe Ruth 2019" upon signing up/signing in. The registration fee will be $125. We will accept 13-15 year old registrations until the end of the school baseball season, but sign up as soon as possible, to help us plan/organize and to join team practices! This spring, there will be a Russiaville Babe Ruth division for 13-15 year old Western students. Our teams will enter in the Howard County Babe Ruth league as Western teams. There are two sub-seasons for the season, Spring Season (April through late-May) and Summer Season (late May through early July). Players on Western school baseball teams may join the teams for the Summer Season. At the conclusion of the Summer Season, All Star teams are selected from all the teams in the Howard County Babe Ruth League. Regular season games are played at various facilities in the area. Babe Ruth teams that we may compete against are Taylor, Eastern, Northwestern, Peru, Lewis Cass, Hamilton Heights, Tipton, and others. We are currently having open practices. Contact us by texting or calling Scott Sipes at 765-404-3495 or Butch Frazier at 765-432-0175 for practice dates and times and to express interest in joining the league. You may also e-mail baberuth@rybl.org. Reser Herefords Crowned the 2018 Rookie City Tournament Champions!!! Welcome to Russiaville Youth Baseball 2018! External links are provided for reference purposes. Russiaville Youth Baseball League is not responsible for the content of external Internet sites.